These bars are my absolute favorite treat! A yummy peanut butter cookie dough maca layer is tucked underneath a creamy spread of cacao and dates. There’s a delectable peanut butter cookie dough layer with chocolate chips underneath a rich cacao-date-walnut layer. That all sounds fancy, but these are actually very easy to put together. You won’t be able to stop eating them, but that’s ok because they’re made with some wonderful wholesome ingredients and a few (delicious) superfoods, like cacao and maca powder. They store well in the fridge and freezer, but good luck keeping them for any great length of time. I’ve been trying to hide them everywhere, but, in my house, they have a way of quickly disappearing! 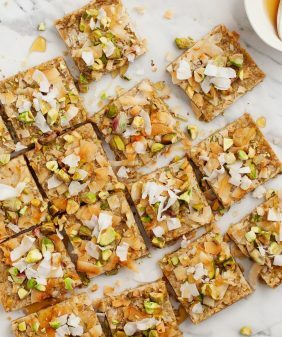 From here, you can dig them out of the pan if you need your snack NOW… otherwise let them firm up in the freezer for 20 or so minutes so that you can neatly cut them into squares. Store the finished bars in the fridge. For longer term storage (yeah right), they can be frozen. I hope you give Thrive Market a try! They’re offering 25% off your first order and a 30-day free trial. No discount code needed, just check out their site! And if you can’t get enough of these bars, try these peanut butter chip cookies or these almond butter brown rice crispy treats! In a large bowl, stir together the peanut butter, coconut oil, maple syrup, vanilla, and salt until combined. Add the almond flour and maca and stir to combine (the mixture will be thick). Fold in the chocolate chips and press into the pan. Place in the freezer so that it firms up a bit while making the next layer. In a small food processor, pulse the walnuts, cacao powder, and sea salt until the walnuts are well chopped. Add the dates and pulse to combine, adding 2 tablespoons water if the blade gets stuck. Process until smooth, then spread onto the cookie layer. Sprinkle with sea salt if desired. Freeze for 30 minutes (this will help them firm up, making them easier to cut). Remove and slice into bars. Store remaining bars in the fridge. Finished bars can also be frozen. Let each bar thaw for about 15 minutes at room temperature. These are definitely on my list to make next!! They sound amazing and look so delicious! Looks amazing…do you ever post nutritional values? I’m watching sugar intake and know that dates are high, just wondering??? Thanks for your great recipes!!! Jeanine, what would you recommend as a walnut substitution in this recipe? Thanks! Hi Sanja, pecans would be delicious! I’d love to make this, but unfortunately can’t use dates (or raisins or prunes for that matter). Are there substitutes (more nuts? other dried fruit?) that would be a preferred alternative / should I just remove the dates and use a different paste of some sort for the same texture? I’ve only tested these with dates, let me know if another fruit works for you! Hello Jeanine, Thanks very much for sharing this yummy recipe! With recent reports on coconut oil being the new “bad guy” AGAIN, what oil would you recommend I use as a substitute? Can I just use good oil olive oil or peanut oil? Cheers! I think another oil could work, I haven’t tried… I still consider coconut oil to be healthy enough. Thanks very much for your prompt response, Jeanine! Sorry about typos. I used my phone and hit post prematurely. I can’t figure out how to edit here. Can you provide the nutrition numbers?? For example how many calories, sugar, protein, fat and carbs does one square or one piece contain? Does anyone know how to calculate macros when making home made foods? I’m assuming you jog down how much you use of each ingredient then add all the macros up and then devide them by # of servings? Good point i like that way if thinking. I’m definitely going to try making these, thanks for the recipe. Yum! Can’t wait to make these!!! Any substitutes for maca powder? I have everything else. 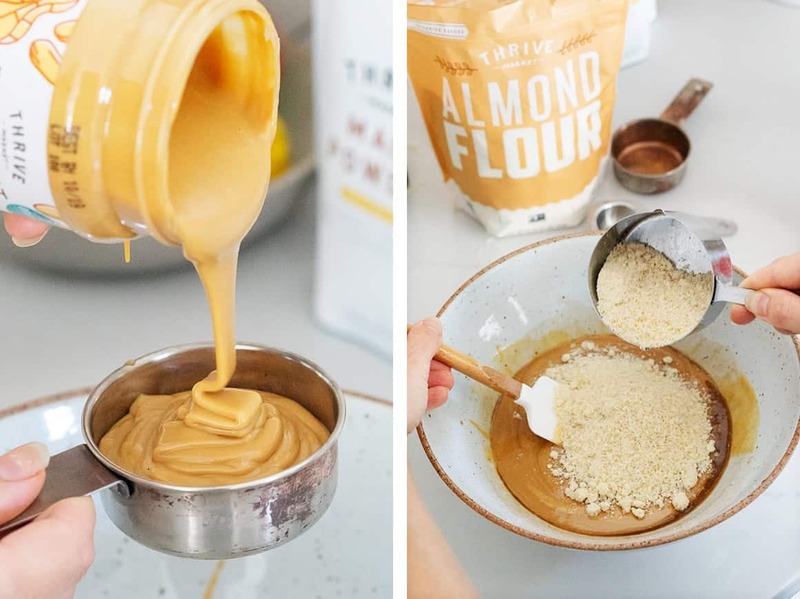 Hi Steph, you can use extra almond flour… hope that helps! OMG! I *really* need these in my life! These bars sound wonderful, but I would have to omit the maca powder. It is probably fine for most people, but if, like me, you are sensitive to stimulants, it’s best to stay away from it. These look fantastic! My daughter is allergic to peanuts, what nut butter would you recommend for the cookie base that would still taste great? 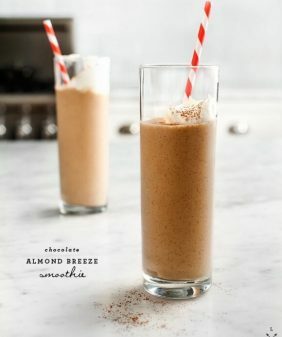 Almond butter is delicious in these! Hi Jeanine–do you think the peanut butter layer would stand well alone as a treat? Thank you! I’m going to reply to myself! 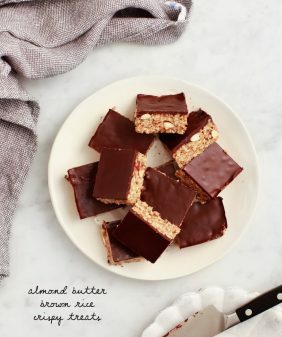 The peanut butter layer could definitely stand on its own, especially to make a very fast treat, but the date/walnut layer makes the bars that much better. I followed the recipe as is, and it’s wonderful! I cut mine into app. 30 squares. Oh my oh my these look utterly scrumptious! I will have to give these a go. I made these yesterday and they are incredible! 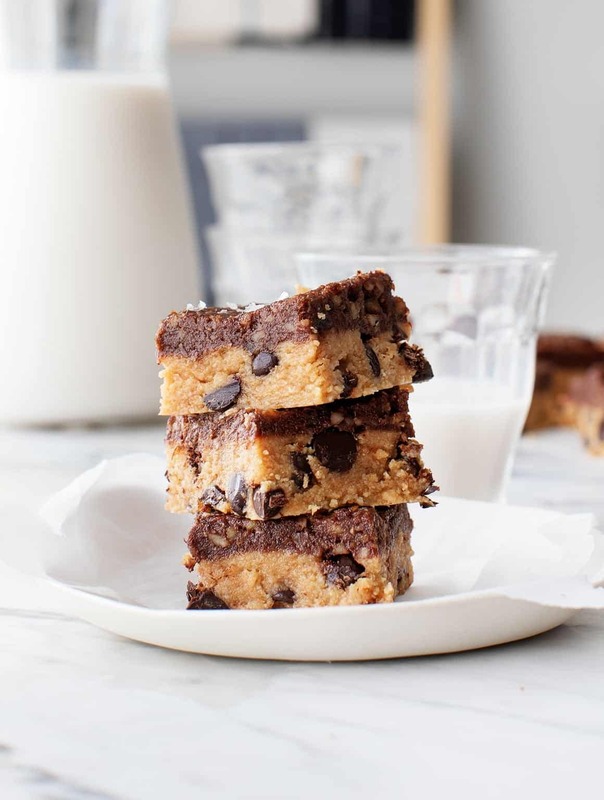 They really taste like cookie dough only they are so much more nutritious 🙂 I love how simple and healthy the top layer is – I added a little extra water to the food processor because it wasn’t getting smooth and spreadable, and that helped a lot. Thanks for the great recipe! Yay, I’m so glad the whole family loved them! These would be the perfect snack when I need a little pick me up. I just sent it to my girlfriend so we can go to the market tomorrow morning and get all of the ingredients! These turned out amazing. 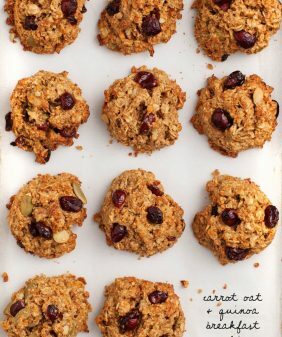 Topped mine off with unsweetened shredded coconut and used chopped tart cherries instead of chocolate chips. Mmmmm. Hi Jacqueline, I’m so glad you loved them! I love that they are naturally sweetened. I might have to throw these in the kids lunches! Thanks for the idea. I made this without the Maca, amended as suggested. I used an ice-cream scoop to portion out the cookie layer into parchment baking cups. After freezing placed a smaller scoop of the cacao layer on top, sprinkled with Maldon salt. This way I have portion control (ha-ha) and an easier way to store and share. Thanks Jeanine for a yummy recipe! Hi Tina, I’m glad you loved them! Thanks for the tip about the ice-cream scoop method! My husband and I made these last night after dinner. SO YUM!!! Hi Beth – so glad you both loved them! Made these the other day, they turned out great! I don’t have a food processor so I just soaked the dates in hot water first and blended the ingredients for the topping with about 2tbsp extra water. I love how filling it is as a snack but easily satisfies a sweet afternoon craving! Hi Wendy, I’m glad you loved them! Thanks for the blender tip! This dish certainly got my attention just by looking at the photos, Jeanine! The recipe shows exactly the ingredients and what to do on them. Can’t wait to give it a try! Oh my! Just made these and they are off the charts YUM!!! yay, so happy to hear! Thanks for coming back to let me know! What would be a good replacement for coconut oil? Hi Lex – you can just leave it out, it has no affect on the texture, they’ll still be terrific without it! I love your blog. These look great. Can I use avocado or some other oil for the coconut oil? My son and I make this recipe all the time – we absolutely love it. We often sub dried cherries for the chocolate chips – which is really delicious. This last time, I was got to making the Cacao Layer and to my horror had only about 1/4 cup of walnuts. But I did have a whole bag of raw pine nuts. I have to say I will make it this way on purpose in the future!. The pine nuts added a depth of flavor that was surprisingly delicious. AMAZING!!!!! I’m obsessed and will make this again and again. Hi Kelly, I’m so glad you loved them! !